Spend £ 231 more to qualify for payment by finance. We’re excited to announce that Sonarworks are offering you a free licence running right through til 1st October for their Reference 4 Headphone Edition, a powerful plug-in which will transform the sound you get through your headphones. Sonarworks are a brand we’ve admired for a long time now, as they have incredible algorithms helping musicians achieve their very best results. Their plug-ins are a godsend for those of us that aren’t blessed with acoustically perfect environments and gear worth thousands of pounds, as they really help to level the playing field. Sonarworks’ Reference 4 Headphone Edition is simple but impactful, aiming to flatten the response of your headphones. Why is that important? Most headphones “colour” the sound you hear, which means they can mask or exaggerate certain frequencies which could negatively impact how you decide to mix your track. Reference 4 HE removes unwanted colouration meaning you can focus on your music instead of worrying about your set-up, and work on the go with your laptop, confident in the accuracy of your mix. The Headphone Edition operates as a plug-in on your master channel, and as a standalone bit of software. The interface is super clean and easy to use and it comes with hundreds of profiles for headphones so most brands are covered. As a registered Focusrite hardware customer, you download your free licence for the Headphone Edition until 2nd May, so head to your Focusrite account as soon as possible. 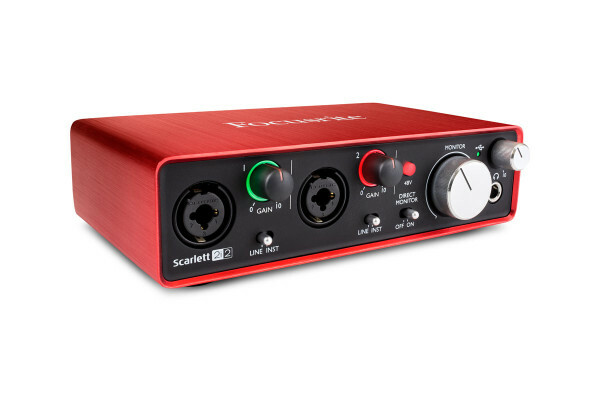 The Focusrite Scarlett 2i2 is the best selling USB audio interface with a 2 input, 2 output configuration. The Scarlett 2i2 is ideal for producers who require great sound reproduction and build quality at an excellent price. The interface is easy to transport, set up and use, which in turn maximises time for your creativity. The Scarlett 2i2 is armed with two natural sounding mic preamps with lots of even gain and +48V phantom power. You have the capability of switching each of these to line input, which have been designed for hot pickups to aide the recording of instruments such as electric guitars. Their utility extends further thanks to the XLR/6.3mm combo inputs. While the Scarlett 2i2 is the ‘baby’ in the Scarlett range, the preamps are exactly the same as you find in the bigger, expensive Scarlett interfaces. These converters are class-leading at a rate of up to 192 kHz/24-bit. Headphones can be connected to the Scarlett 2i2’s dedicated headphone output, which has dedicated gain control on the front of the interface. Whether you’re a singer songwriter, vlogger or producer, the 2i2 is a great addition to your studio arsenal. The Scarlett 2i2 is USB powered, so no need for any other power supples. When connecting microphones and instruments to the interface, Focusrite have assisted further with finding the perfect level thanks to their signature gain halos around the control knobs. Why is this Scarlett 2i2 better than the previous generation? Now in its 2nd Generation, the Scarlett 2i2 makes your recordings sound exactly how you want them. It’s packed full of upgrades including brand new, super low latency* resulting in fluid recording and monitoring in real time. The entire 2nd Generation Scarlett range now operates at up to 192kHz and mic preamps have an improved gain structure. This means you can set your levels accurately, whether mic or line input. The Scarlett 2i2 has analogue protection circuitry on both inputs and outputs to combat against unwanted power surging. What software do I get with the Scarlett 2i2? Seen the FOCUSRITE Scarlett 2i2 (2nd Gen) 2 in, 2 out USB Audio Interface Cheaper?